L-R: Takeshi Nakazawa, Aida-America’s newly announced president enjoys a moment with retiring Aida-America president and COO, Pat Ambuske. After 17 years of service with Aida-America, current president and chief operating officer, Pat Ambuske, has announced his retirement effective April 1. Ambuske looks forward to remaining on the Aida-America board and serving as a consultant. Takeshi Nakazawa, who transferred to Aida-America as vice president of operations in March of 2017, becomes president on April 1. 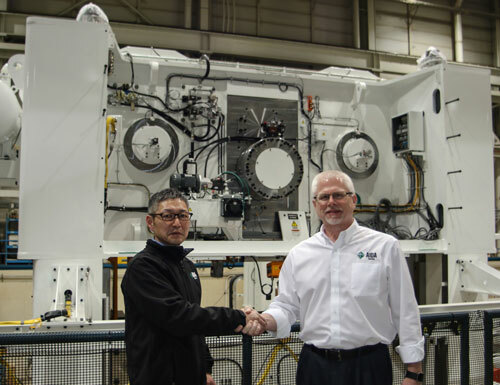 He began his career with Aida in 1987 as a welder for Aida Engineering in Japan and has held numerous positions in multiple Aida locations. Aida-America also announced the promotion of Bob Adkins to director of operations, also effective April 1. Overseeing Production Promotions operations, his responsibilities include planning, purchasing, manufacturing, logistics and facilities management.